Are you a beet fan but stuck in the classic beet soup and beet salad rut? Do you have beets sitting in your home now just begging for a little love? Consider this a personal recipe for you. Due to a slight clerical error while ordering my weekly organic vegetable delivery (turns out the order was in pounds, not units), I found myself inundated with the earthy red roots. Facing a very special dinner celebration, a beet course was clearly added to the menu. But this was not the time to go basic. I was inspired by a photo of a spring flan and the rest, as they say, is history. Successful history. It's the most delicate, light beet dish ever with a loose texture that melts in your mouth. The citrus garlic mushrooms add grounding to the dish and are bursting with flavor. 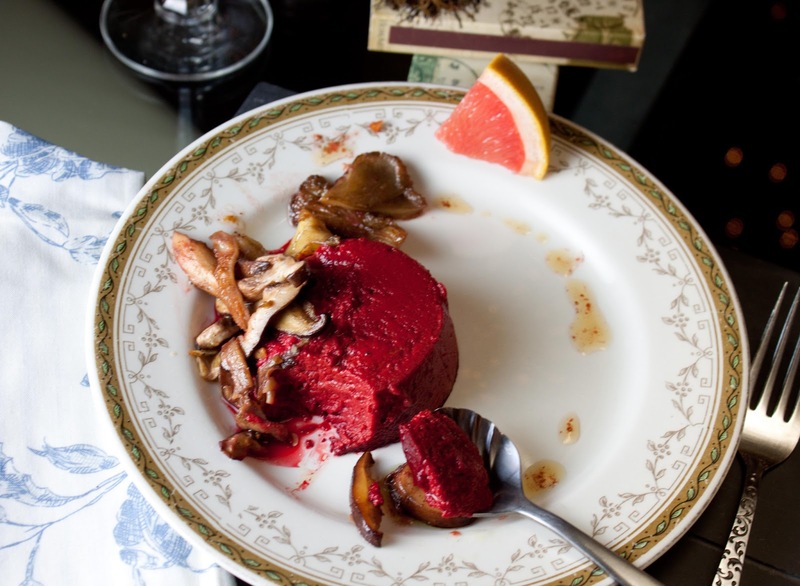 I'll admit that I rarely get tired of basic roasted beets, but why not push the envelope of creativity with this stunning Fat and Happy Beet Fan with Citrus Wild Garlic Mushrooms. There is no better time to make hearty stews than during winter. And while pumpkins tend to be labeled as a fall food, they carry over into the beginning of the year with ease. 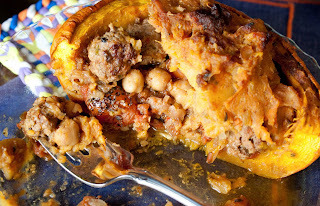 Meatballs with a slightly spicy edge bathing in a cumin and gingery tomato sauce inside a tender roasted pumpkin; each bite finds an interesting mix of the Moroccan flavors. And it's interactive dinning as it's up to the eater to scoop in the bowl as part of the dish. Perfect for a casual family outing or for an elegant celebration dinner, this Fat and Happy Moroccan Meatball Stew will keep you warm and fill your tummy. 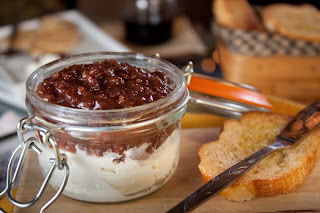 Yes, I've made bacon jam before. Yes, I do realize these are supposed to be the dog days of detox. Yes, I anticipate reinventing bacon jam at least one more time. Maybe two. In this version of bacon compote (or jam), the pink peppercorns reign supreme while the bacon gives that subtle, smokey pork thing that gives depth and makes us temporarily lose our wits enough to spout drunken marriage proposals to stubby legged animals. Fresh cherries are stewed into a luscious, rich sauce binding it all together. Serve with a tangy goat cheese for an amazing bacon jam bruschetta, add to sandwiches, top burgers, dollop on roasted chicken, mix into meatloaf and chili or inhale with a spoon... just get this in your belly! In small doses, bacon compote will give you a little reprieve from your New Years diet and the fat and happy strength to carry on. I'm going down the gingerbread path again, just can't help myself. We were making a gingerbread house with buttercream frosting for the glue; trying to build the house proved difficult because everyone kept dipping the walls and shingling into the frosting and then their mouths. The buttery goodness just works so well with the crunchy gingery, spicy flavor. 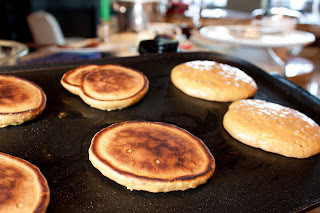 I thought about turning the cookies into a pancake, but it just wouldn't be complete without the frosting. So why not combine a little frosting into the syrup? These pancakes were the hit of the breakfast holiday work party. I mixed the batter before heading in, brought along an electric griddle, a pre-cooked strata and all the fixings. We played 'guess the stache', a fun card game that has an image of famous mustaches on the front and hints on the back. Not sure if it was the pancakes, the game or the champagne, but it sure was a super fun gathering.